The Alaskan hare (Lepus othus), also known as the tundra hare, is a species of mammal in the family Leporidae. They do not dig burrows and are found in the open tundra of western Alaska and the Alaska Peninsula in the United States. They are solitary for most of the year except during mating season, when they produce a single litter of up to eight young. Predators include birds of prey and polar bears, as well as humans for sport hunting. The Alaskan hare is sometimes referred to as the tundra hare. 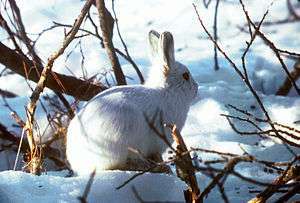 They are one of two species of hares native to the state of Alaska in the United States, the other being the more common snowshoe hare. Both male and female adults of Lepus othus normally measure between 50–70 centimetres (20–28 in) in length, with the tail measuring up to an additional 8 centimetres (3.1 in). Their hind feet are 20 centimetres (7.9 in) long, which is thought to allow them to move easily in snowy conditions. It has been reported that they also use their feet for defense against predators. This species weighs from 2.9 to 7.2 kg (6.4 to 15.9 lb), averaging 4.8 kg (11 lb), and it is thus one of the largest lagomorphs, alongside the similarly sized brown hare and Arctic hare. They have evolved shorter ears than most hares in order to conserve heat throughout the winter months. They also shed their gray-brown summer topcoat, becoming all white during the winter. The Alaskan hare is mostly solitary, and usually only congregate in groups during mating season in April and May. They will normally have one litter per year of between four and eight leverets, with the young born during June and July. The leverets are active shortly after birth, and are born with full coats and open eyes. The closest relatives of the Alaskan hare are the Arctic hare, Lepus arcticus, of northern Canada and Greenland, and the mountain hare, Lepus timidus, of northern Eurasia, from which the Alaskan hare is geographically isolated. They do not live in burrows, but instead nest in open sites. They are most commonly found in upland tundra or in rocky or brushy areas which provide camouflage and protection from predators. Their range includes western and southwestern Alaska, including the Alaska Peninsula. They are herbivores, eating a variety of foliage and fruits, with foraging taking place primarily at dawn and dusk. Predators include foxes, polar bears, wolverines, weasels, and birds of prey. Whilst they are not commonly hunted for food by humans, they are trapped both for their fur and also for sport hunting. 1 2 3 Murray, D. & Smith, A.T. (2008). "Lepus othus". IUCN Red List of Threatened Species. Version 2009.2. International Union for Conservation of Nature. Retrieved 1 February 2010. 1 2 Hoffman, R.S. ; Smith, A.T. (2005). "Order Lagomorpha". In Wilson, D.E. ; Reeder, D.M. Mammal Species of the World: A Taxonomic and Geographic Reference (3rd ed.). Johns Hopkins University Press. p. 202. ISBN 978-0-8018-8221-0. OCLC 62265494. 1 2 3 Earnest, Jeanette R. (1989). "Hares" (PDF). Alaska Department of Fish & Game. Retrieved 1 March 2013. 1 2 3 4 5 6 7 8 DeBruine, Lisa. "Lepus othus Alaskan hare". Animal Diversity Web. Retrieved 1 March 2013.